I’m excited to share that I will be re-releasing a couple of my novels, MORE (More Book #1) and HOW TO SAVE A LIFE (The Haven Book #1), under my own self-publishing imprint Sloan Parker Press. The upcoming books in each series will also be published by Sloan Parker Press. I have a fabulous team in place (beta readers, editors, designers, and more) to help bring you these books throughout 2015 and 2016. The publishing world has been changing rapidly for the past few years, and there are more opportunities for authors to have a say in the process than ever before. I’m thrilled to be able to do more self-publishing of my work. Both MORE and HOW TO SAVE A LIFE will have new e-book covers, and minor corrections will be made to the text of each book. HOW TO SAVE A LIFE will be re-released in January, and then MORE should be out not too long after that (the release dates for these and the sequel for MORE are based on when the rights revert back to me). There may be a few days where the e-book formats for these novels are not available for purchase at the various bookstores due to the transition of the books to my self-publishing imprint. In any case, we’ll be getting all Sloan Parker books back up for sale as soon as possible. 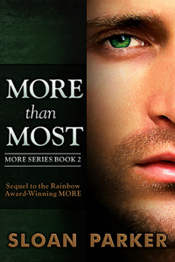 I’ll share a release date for the sequel to MORE (titled MORE THAN MOST) as soon as the details are worked out. But once MORE is re-released, the sequel should follow 2 months later. I can’t wait to share more of Luke, Richard, and Matthew with everyone! 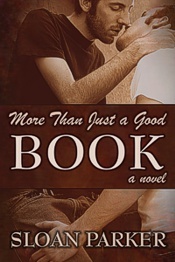 This entry was posted in Announcements, Book News and tagged book news, how to save a life, luke richard & matthew, more, more series, self-publishing, sloan parker, sloan parker press, the haven series by SloanParker. Bookmark the permalink. Yay! 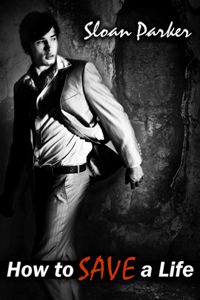 I have been reading each of your emails waiting for news about More Than Most and the Haven series! Thanks for the update. You’re very welcome, Jen. It’s been hard waiting to share the next book, but I’m excited to be self-publishing again.